The tech giant just rolled out new MacBook Pros with improved specs. Upgrades for other Macs are expected later this year, as are Face ID-capable iPad Pros. Apple's (AAPL - Get Report) hardware engineering strengths might just provide a boost to sluggish Mac and iPad sales in the coming months. On Thursday morning, Apple announced an anticipated refresh for MacBook Pro models with Touch Bars. Getting the most attention: Apple is swapping out the 7th-generation Intel (INTC - Get Report) processors (based on Intel's Kaby Lake architecture) that it began placing within MacBook Pros in June 2017 with 8th-gen chips based on Intel's Coffee Lake architecture. With the Coffee Lake CPUs both featuring higher core counts and delivering architectural improvements relative to their predecessors, Apple claims performance gains of up to 70% are possible for its 15-inch MacBook Pros with Touch Bars ($2,399 starting price), and gains of up to 100% for the 13-inch models ($1,799 starting price). And while the new chips appear to be a little more power-hungry, Apple is compensating by packing larger batteries within its notebooks. The arrival of True Tone displays (already found on newer iPhones and iPad Pros) that change a display's color temperature based on a room's lighting. Revamped keyboards said to be quieter than their predecessors. The use of a T2 co-processor for powering the Touch Bar and offloading certain other tasks. Unlike the T1 chip found within older MacBook Pros, the T2 (also found in the iMac Pro) supports on-the-fly storage encryption and "Hey Siri" voice activation. News of the MacBook Pro refresh comes a day after analyst Ming-Chi Kuo, responsible for plenty of Apple-related scoops over the years, issued a note in which he predicted that Apple will also refresh the regular MacBook, iMac and Mac Mini this year -- the iMac will reportedly get "significant display-performance upgrades" -- and launch a new low-cost notebook that might not be called the MacBook Air. Regardless of what it's called, a new low-cost notebook would probably be well-received, given that the MacBook Air (starts at $999) hasn't seen a major update since early 2015. In the meantime, many Windows OEMs have rolled out popular ultrabooks and 2-in-1 systems with price points around $1,000, and Apple's attempts to pitch the iPad Pro as a "mainstream" notebook replacement have yielded mixed results, at best. Regarding the iPad Pro, Kuo (like Bloomberg) predicts Apple will launch Face ID-capable tablets featuring no home button later this year. Just as the iPhone X's lack of a home button and edge-to-edge display allow it to have a smaller form factor than the iPhone 8-Plus in spite of having a slightly larger display (5.8 inches versus 5.5 inches), Apple could make Face ID-capable iPad Pros that are meaningfully smaller than its current 12.9-inch and 10.5-inch Pro models, without sacrificing display size. Between them, Kuo's report and the Thursday MacBook Pro refresh act as reminders of how Apple can leverage its hardware and chip engineering work to differentiate its high-end hardware. Features such as True Tone displays, Face ID support and slimmer form factors might not drive massive sales growth. However, they certainly help Apple differentiate its hardware, and -- just as the arrival of Touch Bars gave a lift to Mac sales in late 2016 and early 2017 -- could provide a boost to Mac and iPad upgrade rates. And such a boost, in turn, could help Apple beat subdued analyst expectations for Mac and iPad sales. 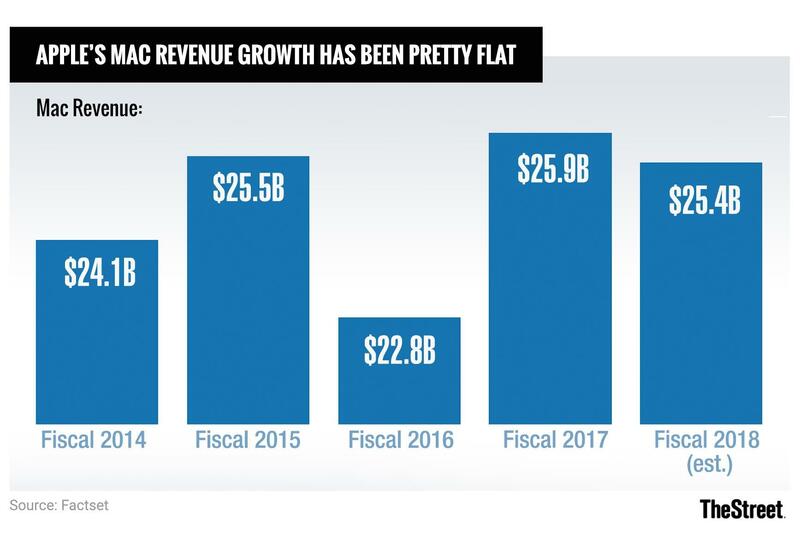 On average, analysts polled by FactSet expect Apple's iPad revenue to drop 1.3% in calendar 2018 to $18.9 billion, and its Mac revenue to drop 1.1% to $25.5 billion. That's a fairly low bar to top. And between them, solid MacBook Pro and iPad Pro refreshes and the launch of a quality low-cost MacBook might be enough to do the job.